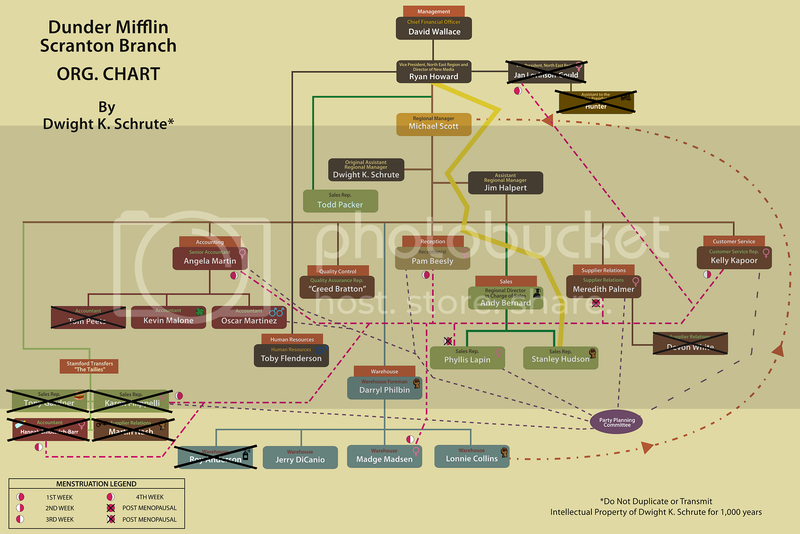 You can now download Dwight’s Dunder Mifflin org chart and emergency overlay (from the episode Did I Stutter?) in all their full-blown high-res glory below. God, that is even more brilliant upon closer inspection. I really didn’t need to know Pam’s menstrual cycle, though. Heh, so apparently the warehouse will be imprisoned under Dwight rule. Hello, new desktop pic for my iMac! Hahaha, I love the symbols! Toby, possibly Jewish, Stanley, black power. So good! I’d like to know why Creed’s name is in quotations. @6: It’s a stage name, and Dwight seems to know that. That is great! I love that he still can’t quite accept that Jim is ranked ahead of him. Dwight has andy killed in emergencies! I love how he has his cousins ranked in the emergency version! It’s so great/scary to see the inner workings of Dwight’s mind. Hilarious! This is my new wallpaper. So Pam menstruates in the first week of the month. Good to know. Anybody know how to get this as a wallpaper? Where is Roy? I love how Devon is included though. Any ideas to why there’s a dashed orange arrow pointing from Lonnie to Michael? 20- I bet it’s because lonnie can physically dominate him lol. Hilarious, but if they included Devon (fired) and Tom (was he the guy that was depressed?) why wasn’t Roy (fired) on the chart? I have really loved Dwight the last few episodes. This is so hilarious! I love all the little details. Looks like he doesn’t think Creed Bratton is Creed’s actual name. Where is Karen? Tom and Devin are on there and they were both mentioned way before Karen was ever on the show? And Andy is there too. Oh dawesome, it was hard to see the details on that Sparklies photo. 22 | Sheikia, my friend theorized that Dwight made the distinction between Meredith’s missing uterus and Phyllis’s natural menstrual-less-ness. 22- I think there are two post-menopausal symbols because Meredith was already in menopause when she started working there, whereas Phyllis was not, so he’s included the last know mentruation information in Phyllis’ symbol. I really want to know which real people came up with this chart! 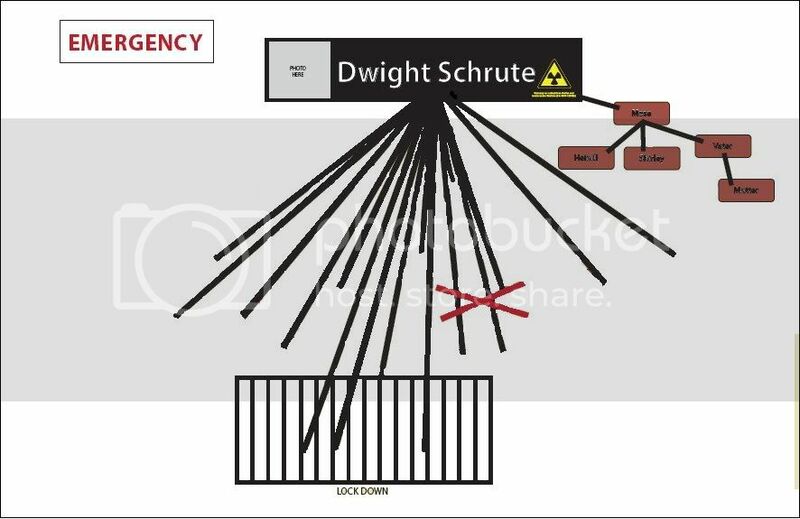 Note how somehow the hierarchy of Schrute Farm’s comes into play in Dwight’s overlay. Give. Me. Power. 22- the only thing I can figure about the two different post-menopausal symbols is that he could be counting Phyllis for age and Meredith for her hysterectomy. Two different causes, two different symbols. It’s Dwight, after all. Details are important. Tom is included! That’s the most awesome. Right when Dwight pulled out the chart I was hoping it would show up online. Thanks, NBC. These are great! The normal org chart is now my desktop. I’ve wanted a copy of one of these ever since the pictures from this episode were first posted a few weeks ago. Does anyone know what the line from Lonnie to Michael is for? So much detail! haha, I love it. I’m SO making this my desktop pic… except I think I’m going to use the emergency one! lol. I love how the writing in the Warning sign in the emergency overlay is in German. That’s Dwight for you. I think this deserves a spot in the Louvre. Dwight’s art is the prettiest art of all the art. I am definitely making a poster with this. The black fists and Creed’s name in quotes, brillant. It’s weird how Devon and Tom are still on the chart, but Roy and Jan aren’t, as some here already pointed out. OMG! The Warehouse crew is in LOCKDOWN if Dwight takes over! LOL! The continuity created by including Tom (*whispers* You know… Tom) and having his name crossed off makes me much happier than it probably should. Haha… Kelly’s menstrual cycle sign is a half moon instead of a quarter, genius. I love how the symbol that denotes “African-American” is a fist! Hysterical! This…is the greatest thing ever created. I’m just really passionate about this chart. In fact, I’m in love with this chart. Thank you so much for posting this! Hi-larious! I love that Dwight thinks that being “Original Assistant Regional Manager” makes him higher than the current one. I’m sad that poor Roy was left off even though Devon and Tom(?) were included. I actually came to the site just now in the hopes that I could find a link to these charts. You’re the best tanster! If NBC made this organizational chart into a tee shirt would I buy it? Warehouse crew on lockdown!!! LOL!!! Haha, the menstrual cycles… How the heck does he know their cycles? Am I right in thinking that the little graduate next to Andy indicates his Cornellishness? Am I the only one that thinks we need an appearance from Mutter? LOL! I love how in the emergency plan, the warehouse is in “lockdown,” and Andy is crossed out! and Dwight uses German! Heres a link to just the emergency overlay. What I did was I printed it out on clear, transparent film(like overheads) and placed it over the original org chart. Really, this is absolutely brilliant. I love how Creed’s name is in quotes, as if that’s only allegedly his real name! He was the accountant who committed suicide. They talk about him in the episode where Michael reads suggestions from the Suggestion Box. Aegean2007 at DVDTalk went through the trouble of posting an updated version of the chart to include Roy, Jan and the Stamfordites. YES! I had faith in you to get this, Tanster! According to Phyllis in Performance Review, Tom was an office worker who killed himself. This is…so brilliant. Every little detail is completely awesome. I love the fists that symbolize African Americans, and that Toby is possibly Jewish. I’ve actually wondered about that for a long time. The emergency chart makes me hope we see more Schrute family members besides Mose one day. what’s with the clover next to Kevin’s name? is he Irish? Why are Devon and Tom from Accounting included on the chart, but Ryan is in place of Jan, and there’s no Roy? JT-Malone is an Irish name. cam3150 – I was thinking of doing exactly the same thing. Previous PostPrevious Buy Andy’s car!